Over the last few years the popularity of the ukulele, has grown very quickly and a lot of people still have a stigma about this instrument. I ask myself why ? 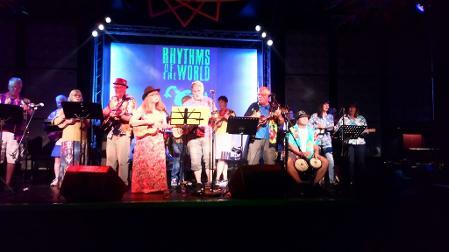 The main reason I can think of is non ukulele players associate the ukulele with George Formby and his type of song. “When I’m cleaning windows “etc. The same sort of stigma is also associated with Amateur radio and the Tony Hancock sketch.. “Can you hear me in Tokyo ! is always heard in both cases. “Yes” George Formby did play the ukulele, but he’s better known for playing the Banjo Ukulele . The Banjo Ukulele is a completely different type of instrument than the Ukulele. The Ukulele is a small looking guitar. The Banjo Ukulele has a round base and has 4,5, 6 strings. The sound is completely different. 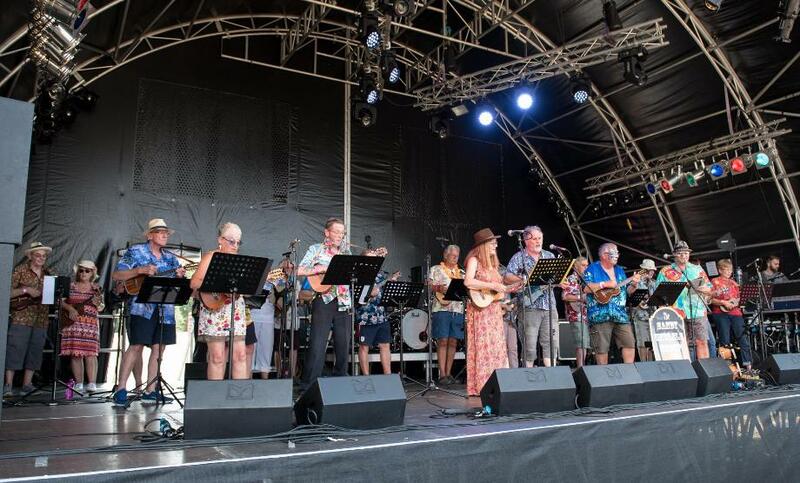 As a ukulele group we do not play any George Formby music or songs, but our own style of “Rock and Roll” which are all covers of the 60, 70’s era. Just recently with the popularity of the ukulele, a lot of people still have a stigma about this instrument. I ask myself why ? The main reason I can think of is that they associate the ukulele with George Formby and his type of song. “When I’m cleaning windows “etc. The same sort of stigma is also associated with Amateur radio and the Tony Hancock sketch.. “Can you hear me in Tokyo ! Can I make the point that “yes” George Formby did play the ukulele, but he’s better known for playing the Banjo Ukulele . The Banjo Ukulele is a completely different type of instrument than the Ukulele. The Ukulele is a small looking guitar. The Banjo Ukulele has a round base and has 4,5, 6 strings. the "Rock and Roll" days. very grateful for a donation for a charity. are acoustic and the sound is lost in the open air. 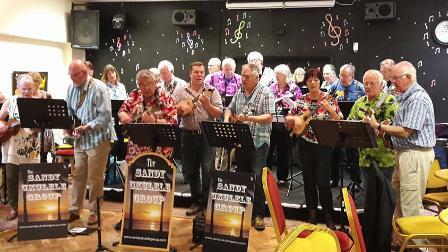 The Sandy Ukulele Group are now offering Ukulele lessons for beginners min age 18 years old. car in the town centre. Meet Friday's 7pm till 9pm visitors welcome. 8.00pm till 10pm "Rock the pub"
Saturday 20th July "Todd in the Hole"